If you are new here and unfamiliar with my weekly What I Spent & Saved posts, it probably is helpful to understand a bit about how I shop. I do something called stockpile shopping. This simply means that when I see an item at rock bottom prices that I regularly use or know that I can use, I’ll buy several of it. This might seem kind of crazy, but it honestly saves me hundreds of dollars a year! 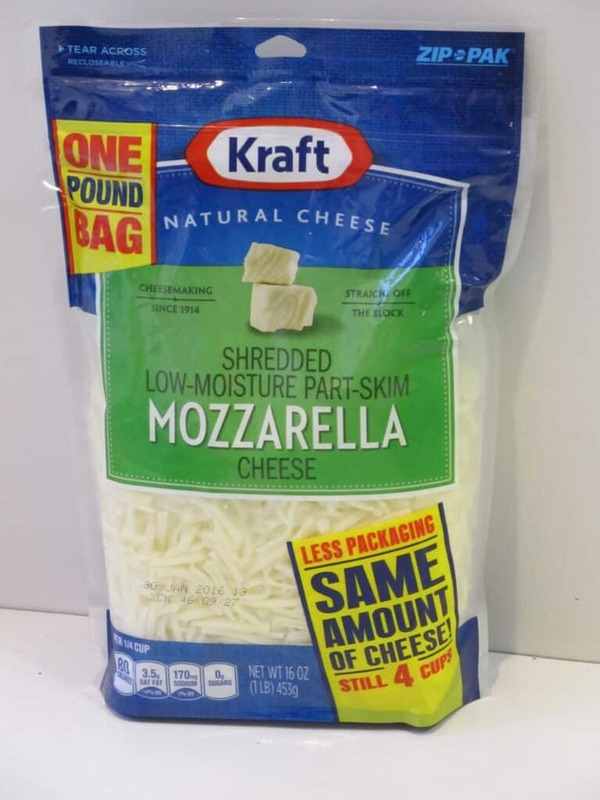 Simply put, by buying 6 bags of frozen veggies when I can get them for $0.50/bag with a coupon and sale instead of paying the full price of $1.50, I save $6.00. This savings adds up pretty quickly! Want to know more about this kind of shopping? 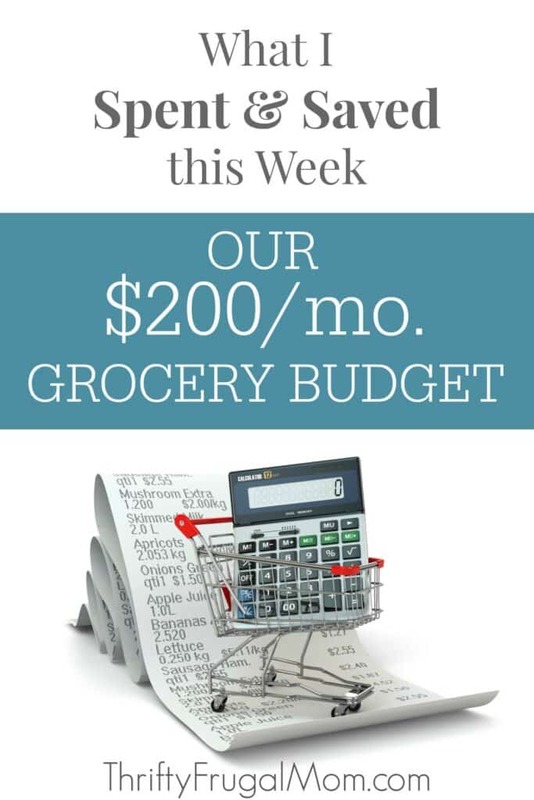 Check out my post on How to Start Building a Grocery Stockpile. 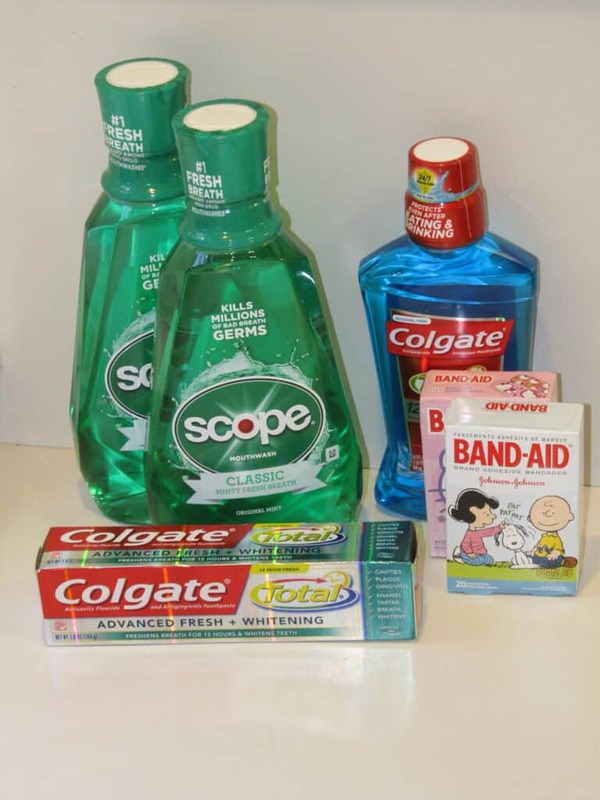 With all the free mouthwash, toothpaste and toothbrushes that I get thanks to couponing, I supposed we have no excuse to have bad oral hygiene! I was able to get the Colgate toothpaste and mouthwash totally free this week. The Scope was a money maker of $0.17. I actually could have made another $2.00 on it, had I not been so forgetful! There was a Mobisave offer for Scope that I meant to claim, but totally forgot about it until it was too late. Oh well, I’m just glad I still was able to get it free! You know how it is with children in the house….you go through lots of Band-aids! So I made sure to buy to boxes this week when I saw that I could get them for $0.99 each. I don’t typically buy the fun kid’s Band-aids because they cost more, so that won me Cool Mom of the Day award with my little ones. Somehow, I let my diaper stockpile pretty much become obsolete. I really don’t know how it happened- if there just haven’t been deals, or if I have just missed them. But anyway, I knew I needed to get pretty intentional about finding diaper deals. 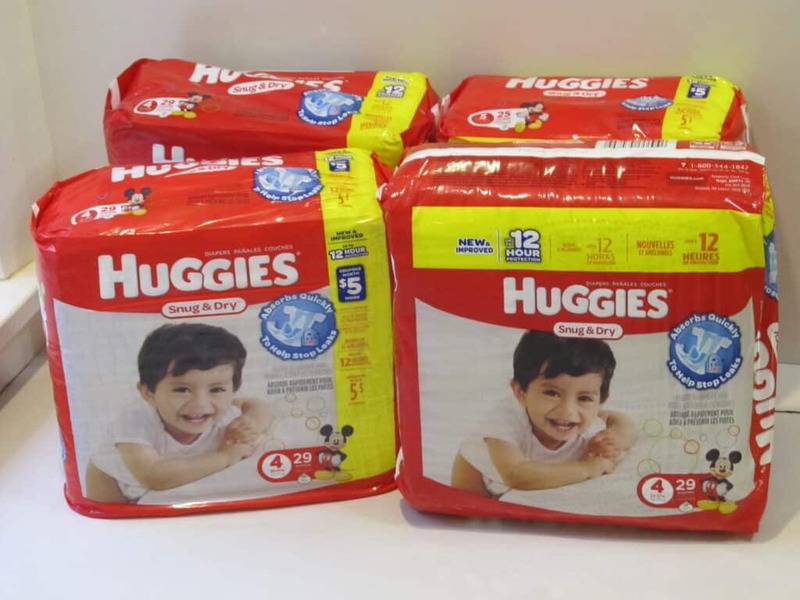 I paid $4.99 a pack for the Huggies, which was just so under my $5.00 a pack buy price. I usually can get them for more like $4.50 a pack and sometimes even less. But at this point, I was getting a bit desperate and was just happy to find them for $5.00. There is a Saving Star offer for Kid Fresh meals where you get $5.00 back if you buy $20 worth of meals. The awesome thing about this offer is that you don’t have to purchase the whole $20 worth of meals in one purchase, but can buy it over several weeks time. I had bought a bunch of Kid Fresh meals several weeks ago and had $15 that went toward the Saving Star offer. So I bought these 2 meals to finish out the offer and basically got them totally free as result. Actually I guess I made $4.00 on them because I also redeemed a Shrink offer as well as a paper coupon too! The ice cream was $0.75 each after coupons and sales. I usually buy the Turkey Hill All Natural ice cream, but since this was inexpensive, I went ahead and got it. The banana cost me all of $0.01 after the usual Checkout 51 offer. 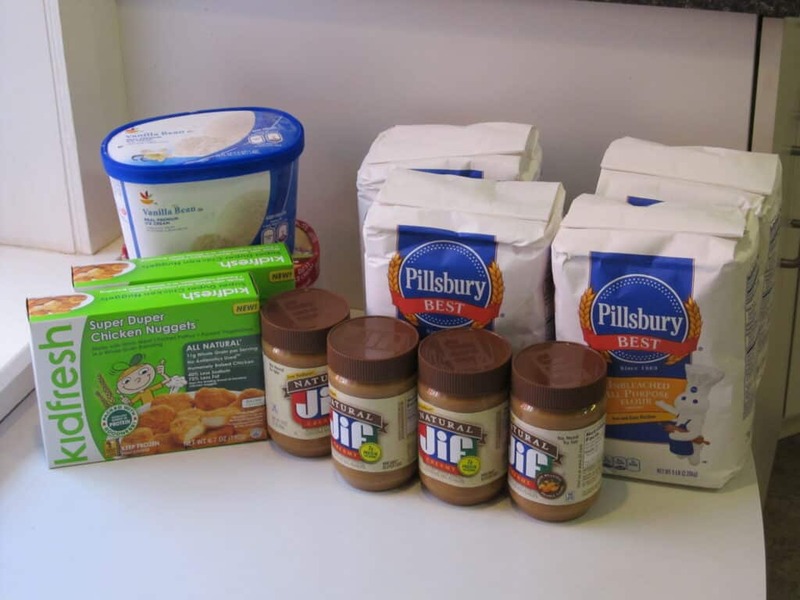 The Jif and Pillsbury were part of the gas reward deals this week. I was happy about that because they are both items that I use regularly and with the holidays coming up, I know I’ll be doing more baking too. After gas rewards and sales, I paid $0.44 each for the Jif peanut butter and $0.21 each for the Pillsbury flour. We are probably not the norm, but we actually prefer the Scott 1000 toilet paper. So whenever I can get it for less than $5.00, I try to stock up! This week, by combining coupons and sales, I was able to get 4 packs for $4.74 each. I really didn’t want 4 packs, but you had to buy that many to get the sale price. So I checked to see if my in-law’s would want the other 2 packs, because I know they always enjoy benefiting from my couponing. 🙂 They are going to buy 2 of the packs from me, so it’s a win for both of us! We both get cheap toilet paper and I don’t need to store 4 extra packages! You’ll notice that I put $9.48 under Credits below to reflect the reimbursement. I stopped by Walmart to grab a bag of Kraft Mozzarella cheese to use to make my White Pizza Grilled Cheese Sandwiches. If you missed the recipe, you’ll want to check it out because it’s one of those comfort foods that you need to make sure gets on your menu this fall/winter! You may have noticed that I’ve done a few sponsored posts, such as this grilled cheese one, here and there over the last couple of months. I love sharing tips and recipes here with you all on my blog, but it also takes a lot of time to write up posts, edit the pictures, keep up with Facebook, Twitter, Pinterest and Instagram and do all the other stuff that goes along with blogging. It’s not unusual for me to spend 30 hours a week on blog stuff- some weeks more, some weeks less, but that’s the average. Anyway, sponsored posts like this are an opportunity for me to earn a bit of money to compensate me for the time I put into Thrifty Frugal Mom. I’m super picky about what offers I accept because I want them to be things that I would naturally post about and things that interest and benefit you all too. But it has been a nice little way to boost our meager income right now while my husband is in school and only working 1 day a week! I’m a member of Smiley 360 and from time to time I’m able to try products for free through them in exchange for a little bit of feedback. 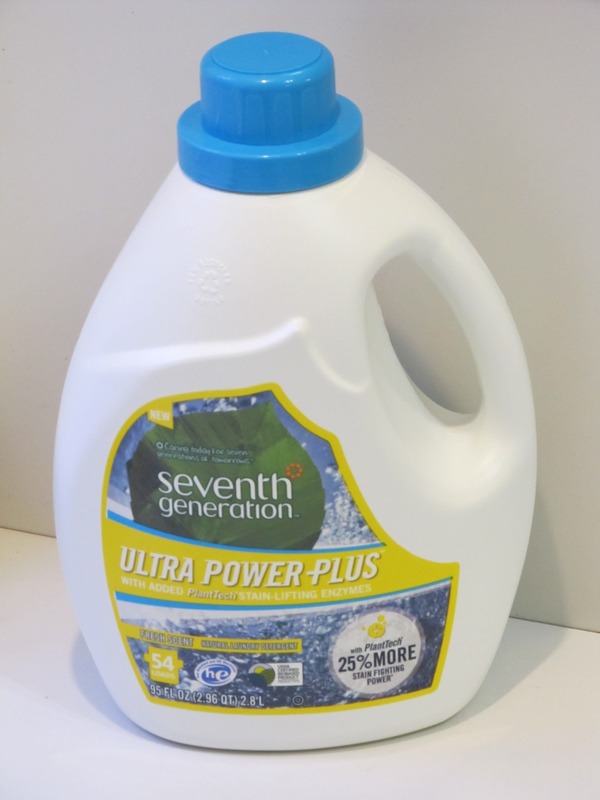 This time, the offer was for a free Seventh Generation laundry detergent, which I was pretty excited about! I admit, I was a tad skeptical that a more natural detergent like this would leave my clothing clean and smelling great, but it did! I had one load in particular that had some pretty smelly pieces in it (we have a child that bed wets) and they all came through without a hint of odor on them. Definitely impressed about that! My only complaint is that I feel like it’s a bit expensive. You may wonder why I show that I paid $12.99 above if I used a free product coupon. I totally forgot to give the cashier the coupon at the register! When I went to customer service, they could only give me a gift card instead of actual cash, so I technically paid for the laundry detergent. But I will use the gift card to pay for future grocery items at Target, so then those purchases will be “free”. You may remember that earlier this year I shared that Zaycon Fresh was offering boneless, skinless chicken breast for just $1.49/lb. when you bought a 40 lb. box? Well, they upped their price to $1.89/lb., which is still pretty decent and from what I hear from many of you, the best price you can find. This week since so many of you signed up through my referral link, I was able to get a whole box for free! And yes, I was pretty excited about that! We’re doing okay financially, but with my husband in school right now and only working 1 day a week, we definitely are much more aware of every expense that comes along. I keep being amazed at all the “little” ways that God continues to provide for us- so often it’s in ways that I would have never dreamed of. I just find it exciting and fun to see how he’s going to surprise us next. This free chicken was one of those “little” ways, that wasn’t so little. It was definitely a huge blessing! And if you purchased chicken through my link? Thank you ever so much! And if you plan to order again, don’t be shy about sharing your own referral link with friends and family via email, Facebook etc. You just might be surprised at how many people are interested. With $5 per referral, it definitely adds up! I cooked and chopped up some of the chicken, then froze it. It’s super handy to have it all prepped and ready to go to use in soups and casseroles. 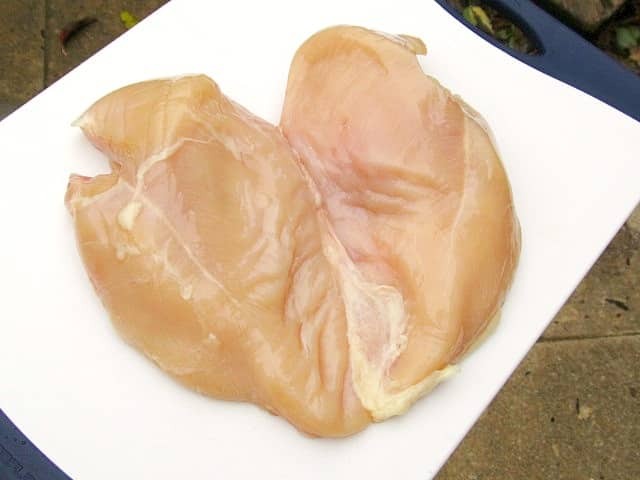 I also froze a bunch raw to use in dishes like my Creamy Crockpot Mexican Chicken. And then I ended up canning some of it too, because in my my opinion, canned chicken just works better for wraps and chicken salad. It is much more moist and has more flavor too, I think. I don’t have a pressure canner (it’s on my wish list! ), but a friend that lives nearby lets me borrow hers and I simply give her some canned chicken in return. It’s kind of nice actually, because I don’t have to worry about finding a place to store it, but can enjoy the benefits of using it. One of the moms from the local MOMS group that I attend brought this huge bag full of apples to share with anyone that wanted. No one else claimed them, so I happily took them all and she was very grateful since they have several trees and haven’t been able to use all of the apples that they get. I think that the other moms must have been hesitant to take them because they didn’t look pretty like store bought apples. But I actually liked that because I knew that they were organic and better for us! The spots were only on the peels and didn’t hurt anything anyway. I used them to make a few apple desserts and some apple butter too. 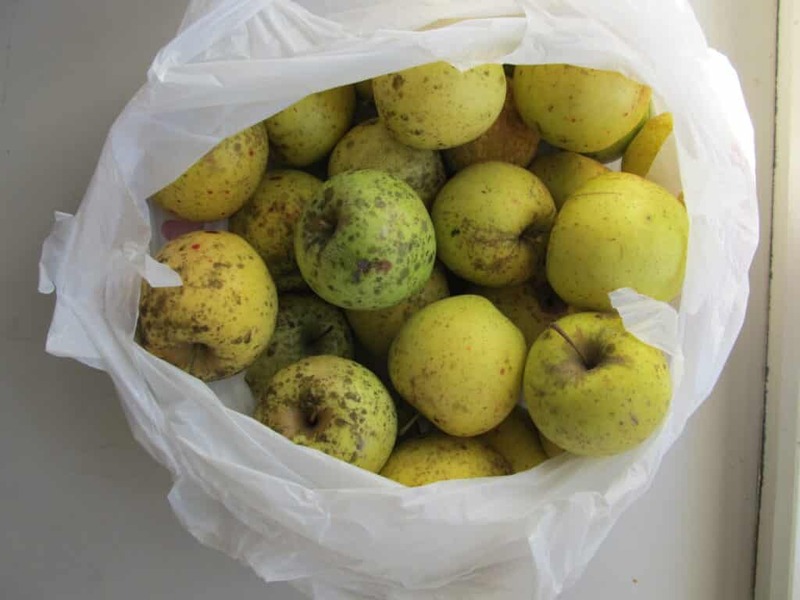 My in-laws also gave us a huge bag full of apples as well. So we’ve been enjoying lots of apple desserts and plenty of apples as snacks too, sometimes with this yummy Healthy Peanut Butter Fruit Dip. I withdrew my Saving Star earnings. I always roll them back into my grocery budget because I earned the money through grocery purchases. This was the payment for the two packs of Scott toilet paper that my in-laws bought from me as I mentioned under my Giant purchases. I was grateful to come in under budget for the month! That felt especially good since it was a 5 week month and that always makes it harder. I still am over budget by a bit for the year, though and really want to try to come out ahead in November so that I can end the year well in December! In case that is confusing, we budget $200 a month for 12 months. We look at our budget as more of an annual amount though, so as long as I am under our budget of $2,400 by the end of the year, we consider that a win. The reason we do this is because I save a lot of money by stockpiling and also by canning lots of fruits and veggies. By looking at our budget as an annual amount, this frees me up to spend more money at certain times to accommodate both of those things. 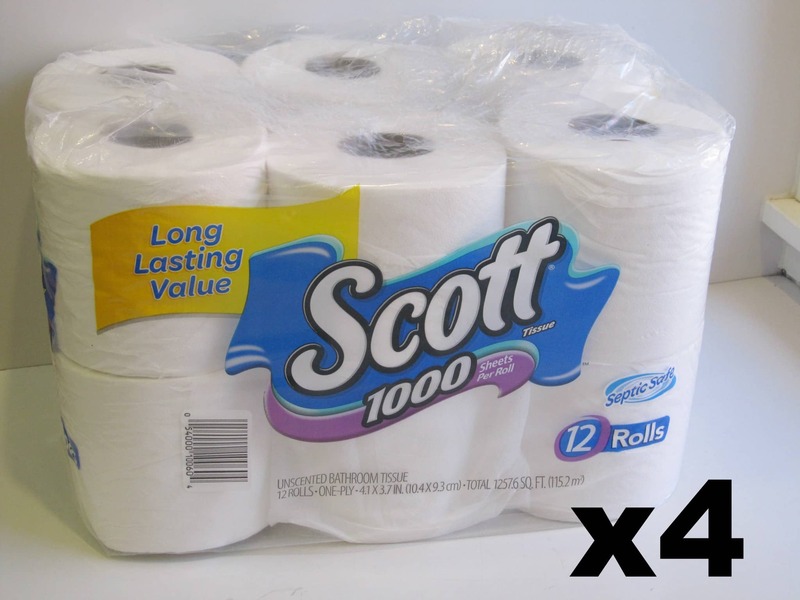 My husband is particular about toilet paper too and from the beginning of our marriage, requested that I buy Scott. He makes so few demands that I watch for sales and stock up whenever I can. And I agree with you on sponsored posts! I just did my first ones this past month. I'm picky, too, but appreciate the opportunity to make a little bit for all the time we spend working on our blogs. It's a great way to earn a little bit more as a stay-at-home mom to supplement our family income! And your grilled cheese sandwich looked amazing, by the way! Yes, I think many people have no idea how much work goes into running a blog where you post regularly. I know I sure didn't. :) Yay for getting your first sponsored post. I know how exciting that is!